Managing a mailing list. I want to see who clicks a link. I want to look good infront of my boss. I need to come up with an idea to improve my firm so I look good infront of the boss. I am focusing on our email list of customers. My boss's PA sends out a email to around 2,000 people a month which basically says "Click on this link for our monthly report". As far as I can tell nobody collects data on how many click or better still who clicks. Can this easily be done? I am guessing the email is sent out from outlook, with the recipients names in BCC. Please just tell me what I need to say to look good in this scenario; I am not totally stupid, but I do need the vocabulary to look as if I have more of an idea of what to do. This entirely depends upon what is serving the file behind the link. Do you know what serves the monthly report itself? I disagree. You can do this with almost any webserver provided you're willing and able to parse the logs. Then you parse the webserver's log for all instances of report.pdf and run the associated strings against your database to find out who looked at the report. If you're happy to pay someone else to send the emails, you can do this through, e.g. Campaign Monitor, which gives you reports like this by manipulating links in your email so that they can track them before they reach your server. That way you don't have to deal with parsing your own server logs. The downside: $5 per mailing + 1c/recipient. You can do this using Google Analytics. You need to tag the URL sent out so that it 'tells' Analytics when someone has clicked on it. Note this won't give you any information on what happens after they click, i.e. where they stayed one second or one hour on your site. Tracking both the site where the monthly report sits and the link itself would be the money shot, but you can start with the link. Thanks all. I now have the buzzwords thanks to all of you and will be able to dig more. But ifanyone has anything to add please chip in. BTW $5 and 1 cent an email looks the way to go. You can do it for free with MailChimp if you don't mind a tiny MailChimp logo on your emails and are sending less than 12,000 emails a month (although there may be a limit on recipient numbers too - but even if you need to pay, the paid version is pretty cheap). 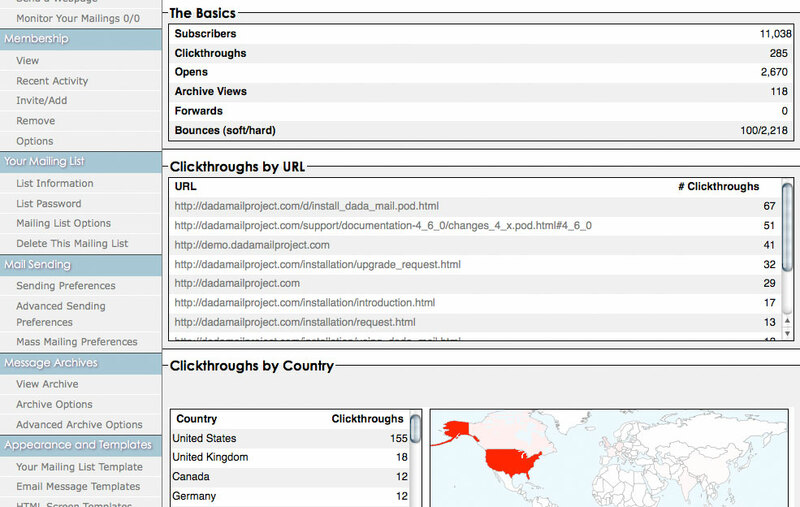 The reports can show you exactly who clicks on what. Also it tracks the subscriber list as you send out regular emails and actually rates your subscribers depending on who interacts most with your emails, so you can see at a glance who the 5-star recipients are (very interested in your mails) and the one star recipients (not interested). Seconding MailChimp. Free (for your size list) and easy, and actually much safer for your company from a spam/list management perspective than doing it yourself via Outlook. I've used both Mailchimp and Campaign Monitor. For this task, Campaign Monitor is a little simpler and a little more user-friendly (I also think the text editor is easier to use). Another benefit of using a service like MailChimp is that it makes it easier to comply with anti-spam laws (which can sometimes be hard to do). MailChimp in particular requires you to comply with the CAN-SPAM Act, and encourages you to be a responsible emailer in general. I've found that as far as reasons go, "so we don't accidentally break the law and have to pay tons of fines" is a pretty good one.